Monsoon Rochelle Red Floral Jersey Bardot Midi Dress. UK 16 EUR 44 US 12. Ex M&S Stretch Jersey Bardot Dress Short. Coral red with leaf print. Wide shirred elasticated off shoulder with ruffle. Gorgeous silky midi dress in black with a white Paisley pattern. 3/4 sleeves. Underarm to cuff: 12.5". Chest at underarms: 46". Very pretty teal tea dress in a stretch jersey fabric by John Rocha, Debenhams. Dress is half lined from shoulder to waist, is gently flared and is worn over the head. Monsoon Size 8 Pink Stretch Jersey Handkerchief Hem Dress Ideal for Summer / Boho Festival. Dispatched with Royal Mail 2nd Class. Boden Size 16 L Stretch Jersey Summer/office/holiday dress. Condition is Used. Dispatched with Royal Mail 1st Class. V-neck front. Cotton blend jersey dress. Light blue/white pattern. Used but in good condition. Lovley quality heavyweight stretch jersey dress with a v neck with a centre front twist feature which gives flattering rouching. It is fitted at the waist and falls into a flattering a-line skirt. It is a good quality fabric which hangs well, doesn't crease or need ironing and is in excellent clean flawless pre-loved condition. Dress is made of stretchy jersey fabric of 100% viscose. PICTURE MAY LOOK SLIGHTLY DIFFERENT BECAUSE OF THE SUN LIGHTS AND OTHER SHADES. Genuine PHASE EIGHT with all inner labels intact. Soft stretch jersey. Slip over fit. Bust - armpit to armpit - 18"/19". Waist - 15"/16". Length shoulder to hem 40". Whistles Jersey Bodycon Dress Size 8, Multicolour. Condition is Used. Dispatched with Royal Mail 1st Class. Genuine BASLER with all inner labels intact. Fully lined. The fabric is stretchy. Other Stuff. Length shoulder to hem 39". Oasis Black Floral Bird Sheath Jersey Dress Size M Stretch Fabric. Super flattering and stylish snakeskin print jersey dress from Cotton Traders. Lots of stretch so would fit a 16 comfortably. Lots of drape in the fabric which finishes below the knee, mid calf( I am 5”4’) please do ask any questions and check photos carefully as I am unable to accept returns non smoking household BNWT Animal Print Stretch Midi Dress Cotton Traders UK14. Condition is New with tags. Dispatched with Royal Mail 2nd Class. Brora jersey stretch dress. Colour is like magenta pink or raspberry with white floral print. Size UK 12. Genuine PHASE EIGHT with all inner labels intact. Lightweight stretch jersey. Size UK 14. Slip over fit. Length shoulder to hem - 42". Mantaray pink mix floral stretch jersey. Fitted midriff band with long side ties to fasten at the back. Pink mix floral on grey stretch jersey fabric. dress UK 14. Excellent condition - worn once. Monsoon blue mix floral stretch jersey dress UK 8. Side ties to fasten at the back. Colourful exotic floral print on a fluid stretch jersey fabric. Sequin trim to the hemline. Excellent condition - worn once. Lovely blue, black and cream printed wiggle dress in a light weight stretch jersey fabric by M&Co. Dress has a half lined upper to waist, has ruching at left side waist and is worn over the head. COS SIZE S 10/12 MARL GREY THICK STRETCH JERSEY DRESS . Condition is Used. Dispatched with Royal Mail 2nd Class. BNWT Blue Jersey Strapless Sun Dress With Stretch From M&S Size 20. TOPSHOP Blue Ribbed Jersey Stretch Bodycon Midi Dress - Uk 6. Dispatched with Royal Mail 2nd Class. ABOVE THE KNEE HEMLINE, SCOOP NECK. LADIES MAX STUDIO DRESS. 3/4 SLEEVE, LOOSE FITTING SHIFT DRESS. THICK QUALITY STRETCH JERSEY MATERIAL. SIZE XL, UK 18. This is a lovely White Stuff green floral stretch Jersey style dress that is in excellent condition and has lovely detailing and design. The dress has 3 /4 length sleeves with a v neck neckline that has a invert. 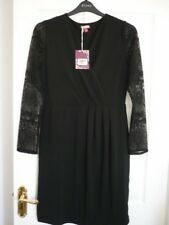 River Island Black Bodycon V Neck Dress Size 16. Condition is Used. Dispatched with Royal Mail 1st Class. Boden Dress size 12 R. Grey and Lilac Floral Stretch Jersey Fabric. Slip Over Style. Machine Washable. Pit to Pit.18”. Length. 39”. LADIES COS NAVY STRETCH JERSEY OVERSIZED PINAFORE DRESS. SIZE SMALL (UK 8). LENGTH: 36". Navy Blue Dorothy Perkins Stretch Jersey Summer Dress Size 16. Condition is Used. Dispatched with Royal Mail 2nd Class. Joules Ladies Riviera Print Jersey Dress White Indienne Floral. Simple but comfortable, the Riviera is a great go-to for a relaxed, casual outfit. The Joules Riviera Print is a relaxing, stylish t-shirt dress. Hip to hip across the front 26in (66cm). No fasten, just pull up. Dress is made of jersey fabric of 95%polyester,5%elastane. Hand wash only. PICTURE MAY LOOK SLIGHTLY DIFFERENT BECAUSE OF THE SUN LIGHTS AND OTHER SHADES. Stylish navy & white floral print in a stretch jersey material. Machine washable. THE BEST THING ABOUT THIS DRESS IS THAT IT HAS THE SLIMMING LINING THAT GIVES A LOVELY SMOOTH SILHOUETTE WHEN WORN. THIS IS A LOVELY DRESS FROM PER UNA RANGE AT MARKS AND SPENCER. IT IS A STRETCHY JERSEY TYPE MATERIAL AND IS A TEXTURED BODY CON DRESS. 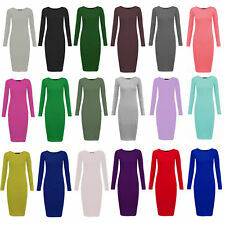 Womens Long Sleeve BodycOn Plainprinted Jersey Midi Maxi Dress Size Midium to larg Condition is New with tags. Dispatched with Royal Mail 1st Class. MONSOON - Lovely Black & White Jersey Stretch Dress - Size UK 12. 100% Modal. Bust Measures 36”, Length Measures 43”. Features A Deep V Crossover Neck, Flattering Light Ruching On One Hip, A Bold Geometric Print, And Pull On Style. Worn A Handful Of Times, But Still In Good Condition. Selling a gorgeous new look royal blue bodycon dress! Fab for a night out or the office in the summer with a pair of sandals! Looks gorgeous on as it’s stretch material and really fitting to your curves!